Of all the names on earth today, one name is more powerful than any other. Christians know it has the power to change lives, save lost souls, heal sick bodies, and secure eternity. It is the name of our beloved Savior Jesus Christ. A Savior Worth Having is a collection of sermons that E.V. Hill has delivered over the years that all center on our own wonderful Savior, Jesus Christ. In an easy-to read and easy-to-understand way, E.V. Hill paints an amazing picture of our glorious Lord. No theological dogma or jargon, just straightforward insights that will send your spirit soaring! If you don't know Him, you should, and you can. Just read on. A Savior Worth Having is a collection of sermons that E.V. Hill delivered over the years that all center on our wonderful Savior, Jesus Christ. In an easy-to-read and easy-to-understand way, E.V. Hill paints an amazing picture of our glorious Lord. E.V. 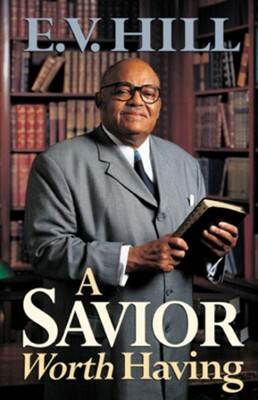 HILL (1933 - 2003), author of A Savior Worth Having and Victory in Jesus, pastored the Mount Zion Missionary Baptist Church, and was a preacher and teacher for conventions, universities, seminaries, Bible conferences, local churches and city-wide revivals throughout the world. Several United States presidents sought his counsel. He was honored by Time magazine as one of the seven most outstanding preachers of the United States. Dr. Hill also served as a member of the board for directors of the Billy Graham Association, America for Jesus, and the Board of Reference of African Enterprise. I'm the author/artist and I want to review A Savior Worth Having - eBook.